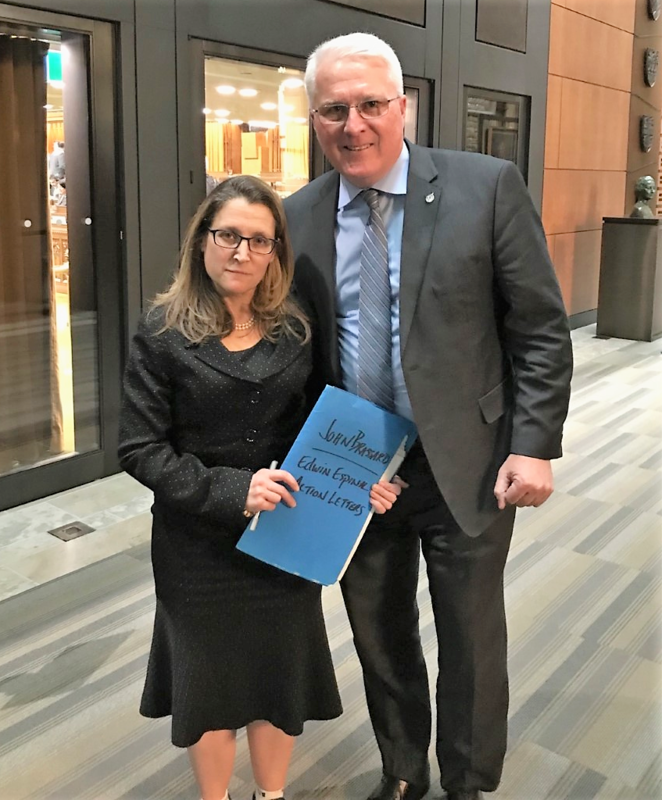 Letters written by students at Innisdale Collegiate, Barrie, advocating for release of Honduran political prisoner Edwin Espinal (member of the Spring family of Elmvale, Ontario), were delivered by Member of Parliament John Brassard, to Minister Chrystia Freeland. Canadian Minister of Foreign Affairs Chrystia Freeland has responded misleadingly, and even deceptively – in the assessment of the Simcoe County Honduras Rights Monitor, Rights Action and Honduras Solidarity Network, to a Parliamentary e-petition on the human rights situation in Honduras, the illegal detention of political prisoner Edwin Espinal, and Canada’s role in the on-going human rights crisis. The petition (https://petitions.ourcommons.ca/en/Petition/Details?Petition=e-1868) was initiated October 10, 2018, by Janet Spring, mother-in-law of Edwin Espinal who has been illegally detained as a political prisoner in a maximum-security military-run jail since January 19, 2018. Edwin is married to Janet’s daughter Karen Spring, a human rights expert and activist living in Honduras since the 2009 military coup ousted Honduras’ last democratically elected government. Compare that to political prisoners Edwin Espinal and Raul Alvarez, who have spent 15 months inside a maximum-security military prison on trumped up charges related to protesting the 2017 fraudulently stolen elections and government killings and repression! Minister of Transport Marc Garneau stands next to Honduran Ambassador Sofia Cerrato Rodriguez during the signing of a new transport agreement on December 11, 2018. Sofia Rodriguez’s father, Wilfredo Cerrato, has been formally accused by the MACCIH of 125 counts of fraud and embezzlement. Her brother, also named Wilfredo Cerrato, has played a key role in facilitating several transactions through his position as President of the Central Bank of Honduras, to several individuals now indicted on corruption charges. Promoted the continuing expansion of Canadian business and investor interests in mining, sweatshops, tourism, and “clean” energy projects. More Hondurans are forced to flee their homes and countries in ‘caravans’ or individually, year after year, than at any time since the early 1980s. Soon to be launched a House of Commons paper petition sponsored by MP Elizabeth May. Letter from MP Cheryl Hardcastle NDP to Minister Freeland. Second Resolution Passed with thanks! At its regular meeting of the March 6, 2019, Council of the Corporation of the Township of Springwater passed the following resolution. Impress upon the Honduran Government of Juan Orlando Hernandez to release Edwin Espinal immediately and drop all charges. Honduran political prisoners -A tiny step forward. The wife of a political prisoner detained in Honduras, speaking by Skype to a meeting in her home town in rural Ontario, today has called on the Canadian government for help in her efforts to free her husband. It’s been a year since Karen Spring’s husband Edwin Espinal, a human rights activist, was arrested on trumped-up charges in the wake of protests against the fraudulent 2017 elections that kept President Juan Orlando Hernandez in power. With her image projected on a wall of the Elmvale community hall, Spring told of the harsh conditions under which Espinal is being held in a military prison two hours from her home in Tegulcigalpa, how a painful ear infection left untreated for a month has caused him to lose the hearing in one ear, and how she has had to fight to get to visit him, which is the only way she can find out anything about him as communication by phone or letter or through prison authorities is not allowed. “Since we were married on October 18 last year, I’ve been only able to see him for six hours,” she said. Spring said she is working with lawyers as there may be an announcement next week of a hearing to be held in her husband’s case. It will determine whether the case will be thrown out or go forward. “We are basically preparing for a show trial,” she said, because of the politicized nature of the Honduran court system. It’s time the Canadian government stop backing the Hernandez regime, she said. Karen’s mother Janet, just returned from a trip to Honduras, decried ‘horrific” conditions in the LaTolva jail – so horrific that the Canadian embassy representative who visited Espinal there last week fainted after coming out of the module where he is being held. “Prisoners are not being treated as human beings,” Janet Spring said. “Our Canadian government is complicit in this because they have not called out the Hernandez regime for these violations of human rights,” she said. The Canadian embassy has made two token visits to the prison, she said, but has not spoken out against Espinal’s treatment. John Spring –Karen’s father – referred to a recent international intervention by Canada, the safe haven offered to 18-year-old Rahaf Mohammed Alqunun, who has no Canadian connection. “Why do you think that a Saudi girl gets the attention of our prime minister, our foreign affair minister but yet Jan has been down to Ottawa six times in the past year and the best we’ve been able to do is get to one of (Chrystia) Freeland’s top aides?” Spring asked. Downey said he has an understanding of the family’s case through the work of Simcoe North MP Bruce Stanton, and he intends to do what he can to help if intervention at the provincial level is possible. Stanton was unable to attend and sent a statement that was read out. MP Alex Nuttall, who has sponsored a House of Commons petition, did not make the meeting either. He has sponsored an e-petition https://petitions.ourcommons.ca/en/Petition/Details?Petition=e-1868 that people are urged to sign before it closes Feb. 7 2019. The Canadian government’s support for the corrupt and repressive Hernandez regime is rooted in economic interests, Russell said – backing the activities of Canadian mining, tourism and manufacturing companies that take advantage of rich land vacated by forced evictions, permissive environmental laws and cheap labour. – Springwater Mayor Don Allen said that last year, after Springwater council voted to support the Spring family’s efforts to free Espinal, he made contact with the Honduran ambassador “and tried to have a constructive dialogue. But there was no meaningful response.” Allen conveyed support from Simcoe County Warden George Cornell and promised that the new Springwater council as well as county council will revisit the matter. Successful meeting held in Elmvale . Freedom for Edwin Espinal and all political prisoners in Honduras! journey of edwin espinal 2018 from the meeting provides a summary of the work in 2018. The Simcoe County Honduras Rights Monitor Committee urges you to read, sign and share the House of Commons e-petition on the Political Prisoners in Honduras . petition e-1868 was initiated by Janet Spring, sponsored by Alexander Nuttall, Barrie–Springwater–Oro-Medonte and will be open for signature for 120 days, until February 7, 2019. You will find the e-petition webpage by clicking here. Join us Sunday January 27! At any given time there are about 100 cases of Canadians or their relatives imprisoned in foreign countries, MP Bruce Stanton says, but none that he has been involved with has been as difficult as Edwin Espinal’s. Espinal, the husband of Karen Spring of Elmvale, is a human rights activist in Honduras who worked closely with, among others, Berta Caceres, the indigenous leader who was assassinated in 2016. He has been held on trumped-up charges in a military prison for almost a year in starkly inhumane conditions with insufficient water, food and medical attention. “We want to see a proper course of justice followed here,” the MP for Simcoe North said in an interview Monday. People who are accused should get due process and their day in court, and not be held “in such terrible 19thcentury like conditions,” he said. “Against all of that, you have this wonderful family, standing up for what’s right,” he added. Stanton praised the Springs – Karen, who stays in Honduras despite the danger to herself (“Honduras is no picnic,” he noted) as well as her family, particularly her parents Janet and John Spring. Asked whether there’s a point at which a country’s treatment of its citizens puts it beyond the pale, and whether Honduras is a country with which Canada should not be having good relations, Stanton agreed. It is up to Foreign Affairs Minister Chrystia Freeland and her officials to decide when and if to go public with criticism – but the decision is a difficult one, as Espinal could face retaliation, Stanton said. He emphasized that the Spring family has Freeland’s attention (even though they have not discussed their concerns directly with her). The fact that when Janet Spring was in Ottawa earlier this month, she was able to meet with Foreign Affairs officials on a couple of days’ notice, is evidence of that, he said. The more pressure is brought to bear by the public, the more effective Canadian diplomats can be, he said. As is detailed elsewhere in this newspaper, Janet Spring left for Honduras on Tuesday. Hopes for Espinal to be released as part of an amnesty for political prisoners, one of the recommendations that came out of a dialogue process mediated by the United Nations, were dashed in December when the Honduran government refused to put the recommendations through congress. Spring will address a meeting to update the community on Sunday January 27 2019, from 2 to 5 pm at the Elmvale Community Hall. Nuttall could not be reached for comment for this article. Where does the Canadian Government Stand? Since January 19, 2018, the Simcoe County Honduras Rights Monitor has been working non-stop to advocate for political prisoners’ release in Honduras. This fight has been an eye-opener, a task that we once thought was straightforward. Yet after 11 months we now understand the situation to be multi-layered and multi-faceted, one that is steeped in back-room politics, corruption, and the lack of regard for human rights across the board. We have made some progress due to public outcry; 18 political prisoners have been freed, yet 4 original political prisoners remain and there have been other arrests. Journalists have been targeted; they have been harassed, murdered, missing, or expelled from Honduras. Protests have been marred with violence. The corrupt political situation, gang violence, lack of rule of law, poverty, and unemployment has forced Honduran individuals and families to flee the county in mass exodus toward the United States to seek asylum. We researched the illegal election of Juan Orlando Hernandez of November 26, 2017 and found that it was indeed an illegal election, and any person protesting or speaking out against it was imprisoned, teargassed, murdered, disappeared, or terrorized. This election was condemned by the Organization of American States (OAS), the United Nations High Commissioner for Human Rights, Amnesty Canada, and other international organizations around the world. Some demanded that a second election take place and produced documents outlining the facts. Other than Minister Freeland’s statement in December 2017 acknowledging the contested election and mentioning that human rights of the Honduran people be upheld, no firm statement from Canada condemning these conditions and this illegal election was made. We found evidence that Edwin’s and others’ cases were fraught with irregularities that we do not condone in Canada. The arrests were improperly carried out, (no rights were read upon arrest; they were snatched away and taken to a military base and later prison, despite being civilians). The Canadian government has not taken a stand and has continued business as usual. Political prisoners were detained with lack of evidence (to this day so-called evidence for all arrests have not been handed over). In Canada, Crown prosecutors must hand over evidence to lawyers. Canada remains silent. The judicial procedure was carried out with lack of due process. Judge Claudio Aguilar who presided over Edwin and Raul’s cases (they were arrested at the same time and sent to La Tolva prison) refused to recuse himself; Aguilar had ordered an illegal raid on Edwin’s family home previously and under Honduran law (and Canadian law) a judge cannot preside over a case involving an individual twice. In Canada, the cases would be thrown out of court. Charges were trumped up; detainees had a laundry list against them. There were and still are no lawyer-client privileges awarded; lawyers are only allowed a few minutes with their clients and under heavy surveillance. Still no evidence was produced. Again, in Canada, the cases would be thrown out of court. Edwin and other political prisoners are held in pre-trial detention, a period that can last up to 2.5 years. We found that in Honduran prisons, over 60% of the prison population is being held in pre-trial detention. Canada remains silent. Political prisoners are held in newly built US owned-maximum security prisons which do not allow for family visits unless permits are purchased at ($150 US) for each family. Those few who can afford the passes are harassed and often denied visits. The prisons are in rural areas far from urban centers, making family visits difficult and expensive. Prisoners are denied medication if ill, food and water is of very poor quality and scant, and prisoners are sunlight deprived. This treatment violates international law and human rights. Canada remains silent. The Hernandez government is wrought with corruption; it has been labeled as a narco-trafficking government. The brother of President Juan Orlando Hernandez – Antonio Hernandez – was arrested in Miami on November 23, 2018 for drug trafficking. Further arrests are pending in cases known as the ‘Pandora Case.’ The Canadian government funds social and judicial projects in Honduras and has done so for years. Canadian fiscal support continues despite lack of success in reforms and this blatant corruption. Is Canada complicit? The Simcoe County Honduras Rights Monitor and its supporters want to know the answer to these questions. 1. Where does Canada stand on human rights in Honduras? 2. Why does Canada remain silent on corruption and human rights violations in Honduras? 3. Whose interests is the Canadian government serving? As Canadians, we will not remain silent. Couple says I do in military prison. My son-in-law Edwin Espinal and fellow political prisoner Raul Alvarez have been incarcerated in La Tolva maximum-security prison in Honduras for over eight months for speaking against the Hernandez government. On Sunday September 30, there was a large uprising in one of the prison modules in La Tolva (a module holds 100 men). Notifications came out on Twitter late in the evening reporting that two men were dead, seven seriously injured. In these instances, the families of prisoners are not notified; they must await media coverage or travel to the prison to inquire as to the state of their loved ones. Like other family members, we spent the night in dread, thinking the worst might have happened to Edwin. It was only through a chance encounter at the Tegucigalpa hospital to which the injured had been taken that my daughter Karen was reassured that Edwin had not been killed or harmed. The horrific conditions and neglect of all prisoners by the Honduran authorities are the cause of these serious and deadly outbreaks. Prisoners are desperate. They are starving, ill, deprived of sunlight, fresh water, they have limited family visits and no contact with the outside world; no phone or written communication is allowed. They have no reading materials; they sit in overcrowded modules and at night in their cells with no hope for change. Tempers mount, desperation sets in and serious conflicts begin with deadly consequences. All prisoners in La Tolva live in dire conditions. Edwin and Raul have each lost over 35 pounds as have many others. Their weight loss is so significant that pressure from an international human rights organization forced prison authorities to send both men to a nutritionist. Due to their lack of a proper diet, which is less than 2000 calories per day and based on starch and very little protein, the nutritionist reluctantly prescribed additional nutrients to be added to their diet. Edwin’s family members were given a prescription to purchase oatmeal and fresh fruit. But in Honduras, extra food ordered by a doctor for prisoners must be found, purchased, and delivered to the prison by a family member. However, the family has no way of determining if the extra food is actually given to their family member or if the amounts are sufficient. Other prisoners whose families either do not have the funds or ability to advocate for their loved ones continue to languish in La Tolva without proper nutrition. There is no change in the water shortage and water quality at the prison. All prisoners are drinking a limited water supply that is brought in by truck, pumped out of the local river. Their living accommodations are deplorable; they sleep on very think pieces of foam; fights break out due to the high stress level of prisoners. Throughout September a dialogue process to deal with the unrest occurring throughout Honduras and the political prisoner situation, has been underway. It is facilitated by the United Nations. One of the mandates of the dialogue is to give amnesty to all political prisoners arrested during and after the illegal election of Hernandez. We fear the amnesty will not include the dropping of all trumped-up charges. We also are concerned that some prisoners will not be granted amnesty due to the seriousness of the false charges levied against them. This dialogue is a flawed process for it only includes representatives from certain political parties that are vying for power. There is no representation from the people or the human rights or social movement groups who understand the poor conditions that the people of Honduras are living in. Over 60% of the population lives in poverty. Much of the male population is unemployed. A recent report by the human rights organization @fosdeh states that in 2017, the Hernandez government spent over 120 million lempiras (5 million USD) on teargas, grenades, gun cartridges and projectile weapons. These weapons were deployed in the streets to suppress any human rights workers like Edwin and Raul who speak out and take a stand against the violence of the government and recently the illegal election of Juan Orlando Hernandez. The Hernandez government officials have also been accused of money laundering, drug trafficking, and theft of monies that fund the hospitals and social security. Yet political prisoners like Edwin and Raul are wrongly incarcerated and have no hope that the corrupt justice system or the dialogue process 4 rule in their favour. There is no rule of law. Corrupt officials are free. The situation is horrendous. Violations of due process continue & more political prisoners behind bars. AMNESTY NOW! There are now a total of 15(now 14) political prisoners in Honduras – five including Edwin Espinal, Raúl Álvarez, Edy Gonzalo, Gustavo Cáceres and (Jose Godínez)–(freed November 14) arrested between December 2017 and February 2018 and an additional ten political prisoners that were recently arrested in August and September 2018. The ten newest political prisoners were arrested in relation to protests against electoral fraud in the municipality of Las Vegas, Santa Barbara. Many have a long trajectory of involvement in the Honduran social movement, defense of natural resources, and human rights work. All 10 are being held in the military-run, maximum-security ‘El Pozo’ prison in Ilama, Santa Barbara, which is also where political prisoner Edy Gonzalo (arrested in February 2018) is imprisoned. To date, the family members of the prisoners from Las Vegas have not been able to visit or communicate with them. For five of the original political prisoners arrested during the months after the November 2017 elections, it has been between almost 9 to 10 months since their detentions. On August 30, Edwin and Raul’s attorneys were notified that the Appeals court in Tegucigalpa had denied their appeal. The Appeals court like the entire judiciary in Honduras is highly politicized and for years since the 2009 coup, its independence has been questioned. In the ruling, the Appeals court confirmed all decisions made by the lower level judge, Claudio Aguilar, ignoring serious violations of due process – the malicious delay of justice (taking seven months to send the appeal to the Appeals court); the lack of impartiality of Judge Aguilar; the harshness of and unjustified pre-trial detention in a maximum security prison; and the lack of jurisdiction of the lower court. In addition, the Appeals court also violated due process by acting outside of its mandate by adding an argument that neither the previous judge or Public Prosecutor’s Office had argued in the lower court. It is not the mandate of the Appeals court to make additional arguments but instead mediate between the prosecutors and the defense and rule on the presented arguments. Given that the national jurisdiction court system cannot legally justify hearing Edwin and Raul’s case, the Appeals court added the argument that Edwin and Raul are part of an “organized criminal group.” No evidence demonstrating Edwin and Raul’s involvement and membership in such a criminal group was ever presented nor did the Public Prosecutor’s office make this argument in the case. By adding this argument, the Appeals court has not made it impossible for the case to be removed from the prejudiced national jurisdiction court presided by judge Claudio Aguilar to the regular Honduran court system. This month and as part of next steps in the case, Edwin’s attorneys from the Honduran organization, Committee of Relatives of the Detained-Disappeared in Honduras (COFADEH) will present an injunction (or ‘amparo’ in Spanish) that will argue how Edwin’s constitutional rights have been violated since his arrest on January 19, 2018. Simcoe County Honduras Rights Monitor & Spring family, Elmvale thank local family owned company Datamax for donating this billboard in support of release of family member and human rights defender Edwin Espinal, spouse of Karen Spring, imprisoned in Honduras! Billboard located on County Road 90 in Barrie Ontario, Canada. Political prisoners Edwin and Raúl send messages from jail! Honduran political prisoners Edwin Espinal and Raúl Alvarez, criminalized on trumped up charges related to protests against election fraud, have been in jail for nearly seven months. This week, from inside the La Tolva maximum security prison, they wrote open letters with messages of hope, thanks, and commitment to the struggle. In this video below , Dr. Janet Spring of the Simcoe County Honduras Rights Monitor, presents the case for the immediate release of the political prisoners in Honduras. The Simcoe County Honduras Rights Monitor is calling on the Canadian government to apply the same standards and expectations to human rights violations in Honduras as it is does regarding Saudi Arabia. “It has been six months since we first urgently appealed to Chrystia Freeland and Justin Trudeau to help our family member Edwin Espinal and other political prisoners incarcerated in atrocious conditions in Honduras,” said Janet Spring of Elmvale Ontario, in a statement today from Tegucigalpa. Edwin has been incarcerated for over six months and has suffered greatly. Edwin and Raul have lost at least 35 pound due to lack of proper nutrition. The sanitation standards in the maximum-security prison are deplorable due to the lack of clean and sufficient water. Prisoners have access to water for only 5 minutes per day. Unflushed toilets, lack of fresh air, and insect infestation exacerbate sanitation levels as documented by the Canadian Ambassador to Honduras’ office staff after they visited Edwin in July. Letter by Kevin Skerrett (CUPE, Canadian Union of Public Employees) to the Canadian government. I write today to join my voice to those of hundreds of others demanding the immediate release of Edwin Espinal from a Honduran prison, either with conditions pending trial, or (more fairly) with the immediate dropping of all charges. The Canadian government must openly advocate for his immediate release if it is to continue to claim to be a defender of human and democratic rights. • that his current punitive (and illegal) jailing is being used by the regime to send a message to other human rights and democracy defenders in the country. I agree strongly with the concerns already communicated to you by the organization Rights Action. The Government of Canada’s policies and actions in Honduras are contradictory: on the one hand, Canada legitimized the 2009 military coup / regime change, and then – against all evidence – rubber-stamped three sets of fraudulent, violent elections since the coup, while turning a blind eye to the increasing rates of human rights violations, corruption and repression committed by the regime since then; on the other hand, Canada funds human rights organizations that are, sometimes, trying to address the violations and suffering caused by the regime. I work as a Senior Research Officer for the Canadian Union of Public Employees, based in Ottawa. I am discussing the detention of Edwin Espinal and other political prisoners in Honduras with my colleagues at the CUPE National Office and across the labour movement. Every single person that I speak to about this issue is appalled to learn of the blind eye that Canada has turned to this terrifying repression. The information about this case, and about Canada’s role in Honduras, is growing by the week. It is urgent that these concerns and issues be immediately addressed. I ask that you do everything in your power to secure Edwin’s immediate release and to keep us informed of your actions. Further, I urge that the Government of Canada withdraw all support for and recognition of the fraudulent election processes carried out since 2009, and to initiate a thoroughgoing review of Canada’s relationship with the current de facto government in Tegucigalpa. There is NO EXCUSE for the U.S. and Canada not to be advocating directly and relentlessly for the release of Edwin, and all political prisoners. Since the 2009 military coup, the U.S. and Canada’s unwavering support for the undemocratic, repressive and corrupt post-coup regimes continues to be part of the problem. Contact directly your elected Senators (https://whoismyrepresentative.com/) and Congress members (https://www.house.gov/representatives/find-your-representative) and make your demands known to them. • In support (in the case of Canada) of the promoting and signing of the potentially illegitimate “Free Trade Agreement” with the government of Honduras; In support of the expansion of corporate investments in Honduras (mining, garment “sweatshop” industry, bananas, hydro-electric dams, tourism, African palm, etc. ), while turning a blind eye to and – in effect – benefitting from repression, fraud, corruption and impunity. On July 19, 2018, Edwin Espinal reached the six-month mark of his unjust incarceration in La Tolva maximum-security prison in Honduras. He was arrested for his peaceful opposition to the repressive government of Honduras, exercising his right to speak with a pro-democratic voice against the corrupt and illegal election of Juan Orlando Hernandez. This election occurred in November, 2017. Edwin has been a target of the Honduran regime due to his human rights work in his community in Tegucigalpa since 2009. Edwin’s illegal incarceration has resulted in his health being compromised. The problems of the lack of water and food, and filthy, fly infested, unsanitary living conditions continue, despite voiced concerns from our community of Elmvale, demands to the Honduran government by the United Nations High Commissioner for Human Rights, and an e-petition sponsored and circulated by Amnesty International Canada demanding Edwin’s release from prison. To date, the Canadian government has not issued a public statement to demand his release, despite our appeals for this to occur. We appreciate concerned citizens of Canada to phone the Honduran Ambassador to Canada – Sofia Cerrato Rodriguez – to voice opposition to Edwin’s illegal incarceration and the Honduran government’s suppression of human rights. To date, Ms. Rodriguez has been unresponsive to emails, and has been indifferent to phone calls that she has received from concerned citizens. She has minimized the circumstances of Edwin’s incarceration, she has deflected the facts of the case by claiming ignorance, she has been indifferent. But it is important that we keep pressuring Honduran authorities, also Global Affairs Canada – Minister Chrystia Freeland and Prime Minister Trudeau – to seek a successful resolution to not only Edwin’s case but to all remaining political prisoners’ cases. They are suffering along with Edwin. We continue to demand a public statement from Minister Freeland, Global Affair, Canada. The Simcoe County Honduras Rights Monitor moves forward with further action to demand Edwin’s release and trumped up charges be dropped. We thank Adam Zimmerman, owner and operator of Datamax Outdoor Advertising, Canada, for assisting us in our campaign and being a champion of human rights in Honduras. Mr. Zimmerman has donated a Datamax highway billboard of our choice to assist our community in our advocacy for Edwin’s release and he has offered to help in any way he can. The billboard will be erected in the very near future. We greatly appreciate this opportunity to spread the word regarding the human rights abuses that are occurring in Honduras, an issue that has touched our Spring family member of Elmvale. The Simcoe County Honduras Rights Monitor committee and the Spring family thank our federal politicians – MP Bruce Stanton and MP Alex Nuttall – and our local Springwater politicians who continue to be extremely supportive of our cause. We thank our community members who have banned together to advocate for Edwin’s release and to call for the upholding of human rights in Honduras. Many have made phone calls, sent emails and letters to government authorities. We appeal to the community to continue to contact those in the Canadian and Honduran governments to act on Edwin’s behalf. Edwin must be released. He was arrested without warrant, without due legal process, on false charges, his lawyers denied full legal files, yet he still awaits release from La Tolva prison after 6 months of inhumane treatment in deplorable living conditions. We thank you all for your continued support. We will fight until we are achieve positive results. I am writing to the very supportive community members of Springwater Township to express my mounting concerns regarding Edwin Espinal and to ask for your help in contacting the Government of Canada through Minister Freeland’s office. We urge Minister Freeland’s office to make a public statement to demand Edwin Espinal’s release and to drop all charges. Our family is very worried about Edwin’s safety as well as his physical and mental state. We have been in contact with Minister Freeland’s office for this request, yet no action has occurred from the government of Canada to date. Family members and friends have also tried to contact the Honduran Ambassador to Canada, Sofia Cerrato Rodriguez, yet she does not respond to emails and rarely answers her phone calls. For two weeks, we had not received any word regarding Edwin, which concerned us. Was he ill? Was he alive? Had he been transferred to another prison without our knowledge? His three lawyers working on his case were denied access to him; they had traveled to La Tolva Prison three times and were told by the guards and the director himself that they had come on the “wrong day,” even though they had arrived to visit him on the days scheduled for legal visits. This made us very worried. Finally, Edwin’s lawyer was granted entry last Thursday, but was not allowed to bring any legal documents in with her. She is never able to meet with him alone to discuss his ‘case.’ There are no lawyer/client privileges. In Honduras, the legal system is wrought with corruption. The judicial system fails the innocent yet protects the corrupt members of the Hernandez regime. Government officials act with impunity. They are above the law. Most of the prisoners in La Tolva maximum-security prison have been denied due legal process, held without evidence, and often without proper legal counsel, awaiting ‘trial’ for a period of 2.5 years. When that time is up, they will not get a fair trial. Prison authorities are able to impose new ‘rules’ on a whim. Families have no legal rights or recourse to question the broken system that bans them from visiting family members. They are bullied. They are terrorized. They are scared to question the ‘rules’ and restrictions and to speak out. Another grave concern is that the phone system is still off in the prison; prisoners have not been able to have phone contact with families since April 4th. Families must physically travel to the prison and are unable to visit loved ones unless they have purchased visitor permits and have received them. Some members of Edwin’s family are still waiting for their permits. Then families must make that horrible trip to La Tolva, which is at least a 2-hour drive each way from Tegucigalpa, as it is in the middle of nowhere. Their visits are at the whim of the prison officials. Many times, they are turned away. This is totally unacceptable and breaks all international human rights laws on visitation rights. On top of the deplorable political prisoner situation in Honduras, I am totally horrified and dismayed at the continual reporting of the great number of money laundering, drug trafficking, and legal scandals that the government of Juan Orlando Hernandez has been involved in – his court appointees, his Ministers, and himself, since he illegally took office back in 2014. I feel that Hondurans have been totally robbed of any chance for a decent life in their country, which accounts for the very upsetting migration and separation of families at the US border, further sparked by the aftermath of the disgusting, illegal ‘zero tolerance law’ brought in by the Trump administration. It seems that Honduran jails need to be emptied to make room for corrupt government officials who are breaking the law both in the US and Honduras. I truly feel there is not enough space in these maximum-security prisons to house them all. I am becoming more frustrated and disgusted as time moves on and can only imagine how devastated the Honduran population is regarding this government corruption in the country. I can’t imagine the upset and despair of those who have emigrated from Honduras (the very fortunate ones) to move for a better life elsewhere as they listen to how the state of affairs in their home country is worsening and impacting family members who may still live there. I would greatly appreciate you making a call to Minister Freeland’s office or emailing her staff to DEMAND THAT CANADA MAKE A PUBLIC STATEMENT TO FREE EDWIN ESPINAL AND OTHERS AND TO DROP ALL CHARGES. I ask you to also call or email SOFIA CERRATO RODRIGUEZ – HONDURAN AMBASSADOR TO CANADA to make the same demand for their freedom. We are fretting about Edwin’s safety. Furthermore, Edwin and Raul Alvarez (also in La Tolva on the same charges) should not even be in this maximum-security military prison. Their rights have been completely violated; their detention is illegal, charges are trumped-up, breaking all international human rights and legal rights standards. We need Canada to make a stand to demand their freedom now. Please help! I thank you for your continued support and for all the comforting words you have given our family. Amnesty International and Amnesty International Canada announcements. Sign the call for immediate release of Edwin Espinal and all political prisoners. Signup at link below. Support signing sent to Attorney General Honduras and to Chrystia Freeland. Click on TAKE ACTION for information on how you can help. Ben Prowess-Honduras Delegation Day 6: The conclusion. Today the members of the official delegation departed for Canada and the United States. Last night, reflecting upon our work, we felt that we had actually accomplished a lot for such a short trip. We had meetings with the Canadian and US embassies, with the UN, and with different Honduran government officials. More importantly, with the help of local lawyers, media, and activists, we were able to gain access to visit the jail where political prisoner Edwin Espinal is being held – despite heavy resistance from the government. We also got to meet with the family of Berta Caceres, who urged us on in our work. And we know that the work will not stop. Karen and I are staying in the country longer. We will be attempting to organize meetings in DC and Ottawa. We will keep trying to get Edwin out of jail, and charges dropped for all political prisoners. And we will be back. Ben Powless-Honduras Delegation – Day 5. (Day 4 was spent just meeting with embassies and the UN) We travelled the night before to La Esperanza, hometown of murdered Indigenous leader Berta Caceres. Simcoe County Honduras Rights Monitor Blog at WordPress.com.